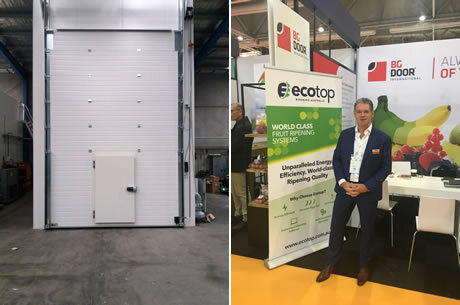 During the Fruit Logistica in Hong Kong, BG Door International introduced their new company, Ecotop Ripening Australia. Together with local partners from Melbourne, they can now supply the Australian and New Zealand markets with modern ripening chamber technologies. “We get a lot of demand from Australia in particular for modern and low-energy ripening chambers. We know of a number of retailers who will be making this switch in the next few years. Because of this, we decided to invest in a local branch on the Australian market,” says Jan Kessel of BG Door International. Left: The testing chamber with the gas-proof ripening chamber door including the special wicket gate. Right: Jan van Kessel during the Asia Fruit Logistica. “Because of the Australian safety requirements, a wicket gate is an absolute must in the ripening chamber door. To prevent the leakages that occur with regular wicket gates, this ripening chamber door has been equipped with a special, gas-proof wicket gate. This is a first on the market,” Jan concludes.